Take advantage of this morning excursion to discover Teguise and its renowned market. 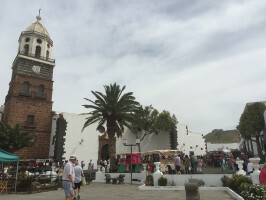 This half–day coach trip will take you to the picturesque village of Teguise, located 20km from Arrecife, one of the main cultural and tourism centres in the island. 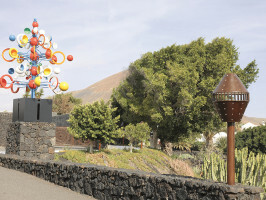 The town was founded in 1414 and was the capital of Lanzarote until 1852. 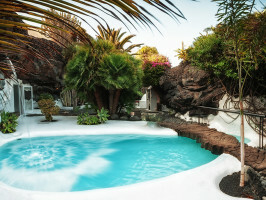 The tour will also take you to the Cesar Manrique Foundation, a stunning construction built by the local artist from volcanic basalt. 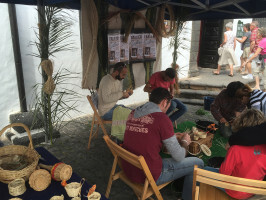 Every Sunday, Teguise is transformed and the peace and quiet of its streets and plazas gives way to the hustle and bustle of an animated street market. 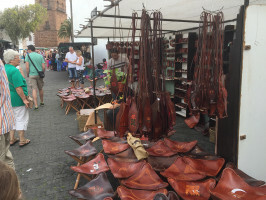 This is one of the most important markets in the Canary Islands and you will be able to snap up all kinds of handicrafts; pottery, basketwork, leather goods as well as a large array of all sorts of natural produce including cheese, wines as well as cacti and Aloe Vera products. You will also find many local artists selling their creations. If you’re in the mood, you can enjoy the live folk music and dance at the Plaza de los Leones. Then after some free time to roam around the stands we head off to the Cesar Manrique Foundation at nearby Tahiche. This amazing building was once the home of the famous artist and now houses artworks created by Manrique himself, as well as some original sketches by Pablo Picasso and Joan Miró. The building itself consists of five areas situated within volcanic bubbles, the rooms bored into volcanic basalt. 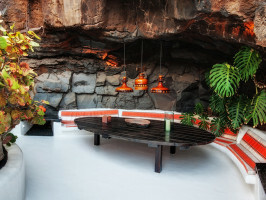 There is a central cave which houses a recreational area, including a swimming pool, a barbecue and a small dance floor. Languages: Spanish, English, German, Dutch and French.